I’ve always wondered what fricassée meant (I had to google “wiki fricassee” to find that. Try saying it out loud, it’s fun), and making this recipe meant I finally looked it up: poultry stew in gravy thickened with dairy. I’ve strayed a little from that definition in making this but I hope it’ll do. I came to this recipe via Port Salut. 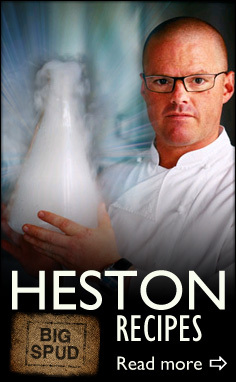 It’s a cheese I’d almost forgotten about; until I was sent some to try along with some Jean Christophe Novelli recipes. I’ve had the pleasure of meeting Jean Christophe before and couldn’t wait to try these out. Essentially chicken, leeks and mushrooms sweated down with cream and cheese – what’s not to like? 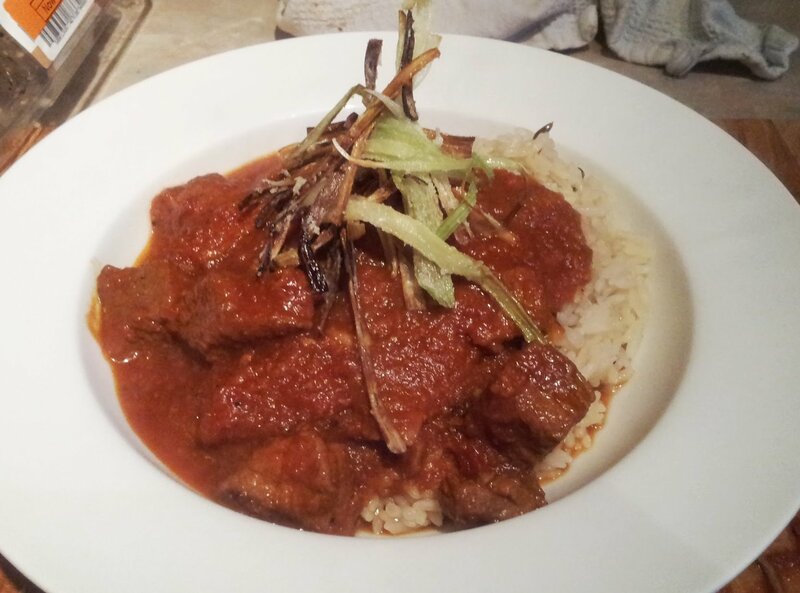 I substituted a few things based on my larder and came up with a wholesome and tasty one-pot dinner. The Port Salut was creamy and nutty, kinda like a Brie. Personally speaking I’d put the breadcrumbs to one side and serve it with tagliatelle next time. I think it would be great all tangled up with some pasta. Preheat the oven to 180°C. Put a large casserole dish on a medium heat and a little oil. Dust the chicken with paprika and season, then fry in the pan for a couple of minutes until coloured all over. Remove to one side. Turn the heat down to low, melt the butter in the pan and add the leeks, rosemary and onion. Sweat gently for 5 – 10 minutes until softened. Add the mushrooms and garlic and continue to cook for a further 5 minutes, then crank up the heat. Add the wine. After a minute of bubbling away stir in the creme fraiche, sliced Port Salut and put the chicken back in. When everything is melting together stir well and check for seasoning. Top with the breadcrumbs and diced cheese and bake in the oven for 15 minutes, or until everything is bubbling and brown. This entry was posted in cheese, creme fraiche, food, leeks, mushroom, wine and tagged jean christophe novelli on July 27, 2012 by Gary. 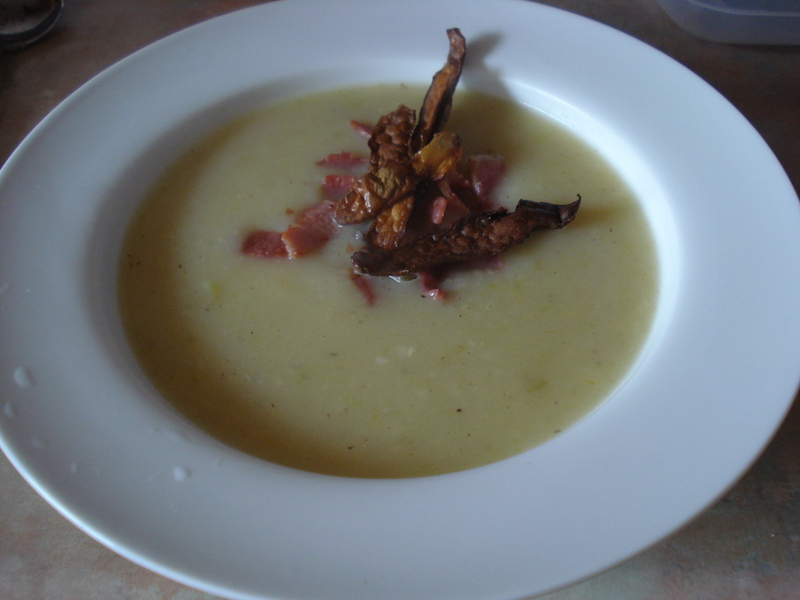 It’s June and I’m writing about leek and potato soup. Bloody June. The weather has been truly atrocious this year in England and so instead of craving salads and light meals I want soup. 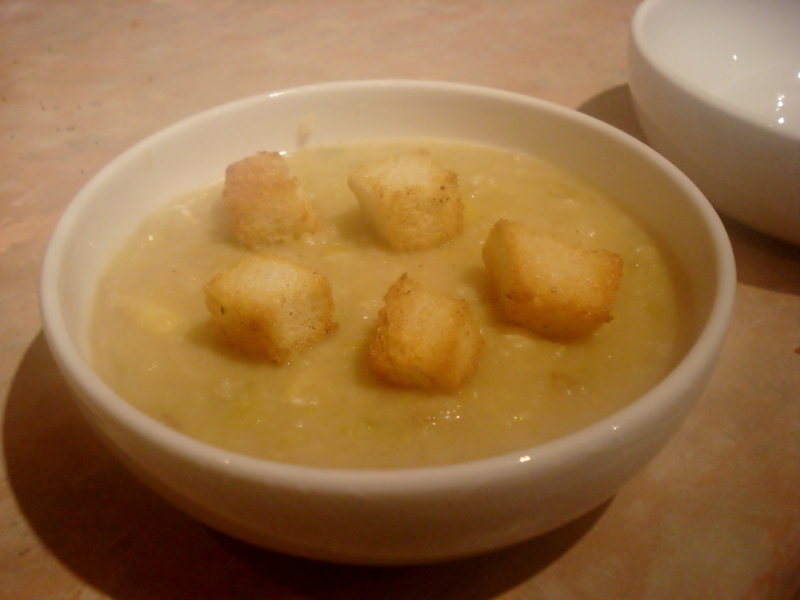 So I have some, and to cheer myself up gild it with all manner of little touches to try and make it my ultimate leek and potato soup. I keep the stiff green tops and simmer them in the stock, I keep the potato peelings and bake them into a crispy garnish, and use the logic that everybody knows: bacon makes everything better. Preheat the oven to 180°C. In one saucepan get the stock to simmering point and add the green tops and the garlic while you get on with the rest. In a large casserole dish melt the butter, then fry the bacon over a medium heat until crisp and then remove. Make sure the leeks are washed and add to the pan, then pop the lid on and turn the heat down to low. Meanwhile, bake the potato peelings. Toss the peelings in a little oil, salt and pepper and put on a baking tray in one layer. Pop in the oven for 10 – 15 minutes until crisp and then put aside to cool. After 10 minutes the leeks should be softened so add the potato, crank up the heat and fry for a couple more minutes to warm up the potato. Fish the garlic out of the stock (it should be bobbing on top anyway) and add to the leeks and potatoes. Discard the green leek tops and add the stock to the pan. Bring to the boil then simmer for 15 minutes or until the potato is tender. Blitz a bit with a food processor until it’s the texture you like (I like thick but not pureed, but hey-ho). Ladle out the soup into bowls and top with the bacon and crispy potato skin. 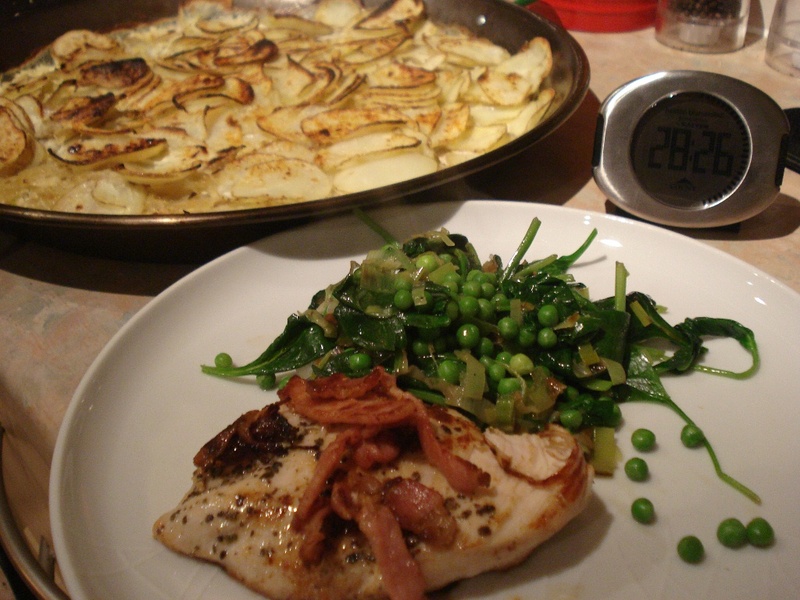 This entry was posted in bacon, food, leeks, potatoes, soup on June 16, 2012 by Gary. This is largely based on a recipe from Jamie’s 30-Minute Meals (yes, I still haven’t cooked them all) but without the crazy Ryvita-apple salad (?). I’ll be honest: the only reason I made it was to have a squirly-whirly sausage which somehow makes me grin more than regular daisy-chained sausages. But the leek gravy is the surprise star, all sweet and silky. I’ve added a dollop of creme fraiche to make it even more smooth and tasty. Great stuff as the nights draw in. Get the grill on medium, and two lidded saucepans on a low heat. Fill one of the pans with boiling water, add the potatoes and garlic, a large pinch of salt and get them simmering away. Allow the sausages to unravel and squidge the meat together so you get one long sausage as opposed to lots of links. Push a couple of skewers through the sausage to hold it in place. Douse with olive oil and sprinkle with half the sage. Pop under the grill for 10 minutes. Chuck the leeks along with some olive oil and the remaining sage into the other pan and a splash of boiling water, then clamp the lid on. Let these whistle away for 5 minutes until tender, then sprinkle in the stock cube and flour. Stir well and when well combined add the cider. After a minute or two bubbling away top up with the same amount of hot water and simmer. Flip the sausage over for a further 5 minutes or so until browned. In the meantime check the potatoes are cooked through; when done drain well and add the butter and mustard. Allow to sit for a minute and then mash until it’s a smooth as you like. Check for seasoning. Take the leek gravy off the heat and whisk in the creme fraiche. Serve up the sausages with a pile of mash and drown with leeky gravy. 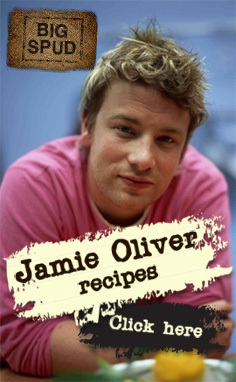 This entry was posted in cider, leeks, sage, sausages and tagged jamie oliver on September 19, 2011 by Gary. 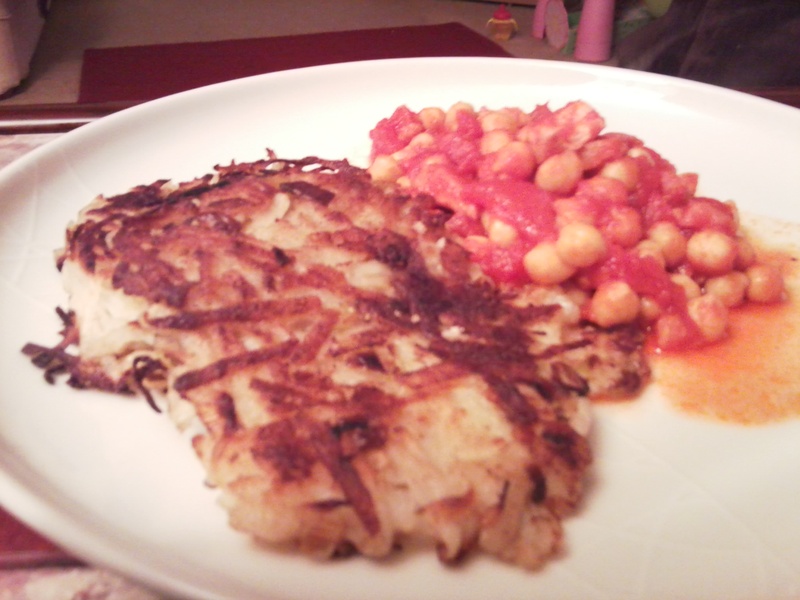 I saw this great recipe on Waitrose’s website (you need some magic Flash gadget to make it work): “leek rosti, BRILLIANT”. 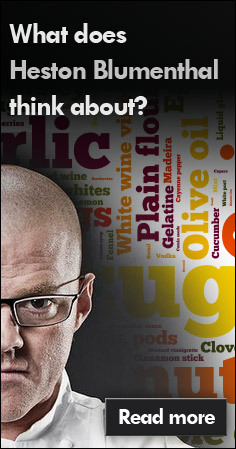 I duly bookmarked it to cook later in the week. I settle in front of the oven and fire up the recipe and something struck me on this cold Sunday evening: it was served with a carrot salad. A freakin’ carrot salad in January. What was I thinking? I quickly swapped in a hearty and comforting tomato and chickpea stew and I’m so glad I did. The rostis themselves are great too. Boil the potatoes in boiling water for 6 minutes until just tender. Allow to cool for 10 minutes. Grate the potatoes and combine with the leeks, corianders and cumin. Season and form into squat patties. Heat two pans with some oil in each: fry the patties in one until browned and flip over. In the other pan chuck in the chickpeas, tomatoes and paprika and bring to a high heat. Keep it bubbling hard to remove the excess liquid. When the rostis are done drain on kitchen paper. Check the stew for seasoning and add any spare coriander you have. 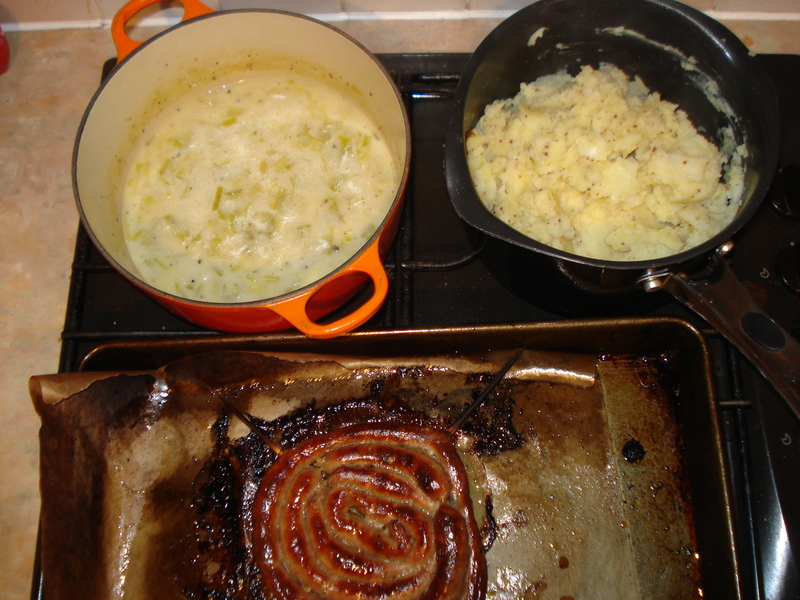 This entry was posted in leeks, potatoes on January 23, 2011 by Gary. If you’ve got some cracking ham stock knocking about from a recent joint, why not make some amazing leek and potato soup? Especially if Philadelphia give you a hand on Twitter. Stirring cream cheese through it right at the end leaves you with a creamy, tangy finish… lovely. Heat a little oil in a large casserole pot. Drop in the leeks and cook gently for a couple of minutes, until the leeks have softened. Stir in the potatoes then add the stock. Bring up to the boil and simmer for 20 minutes or until the potatoes are tender. When the soup is about halfway, toss the bread in the oil, salt and paprika. Pop on a baking tray and roast for 10 minutes, or until the bread is crispy and golden. When the potatoes are tender, use a hand blender to pulse the soup a little. I like it roughed up a little so there’s plenty of texture remaining. Whisk in the cream cheese in chunks and check for seasoning. Serve with the croutons. 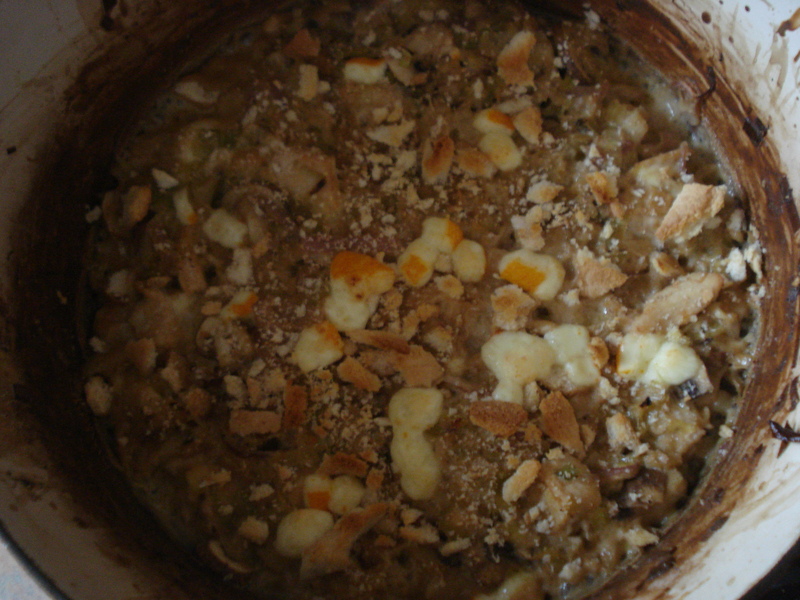 This entry was posted in cream cheese, leeks, potatoes, soup, stock on January 6, 2011 by Gary.